Dont let the long directions throw you - This is so simple. Spend about 20 minutes making a large batch of refrigerator-friendly, no-knead bread dough that, following a standard rise, can keep up to two weeks. Each day, the desired amount of dough can be removed from the batch, shaped and baked. It also makes a great pizza dough! In a 5-quart bowl, combine the yeast, water and salt. Add all the flour, then use a wooden spoon to mix until all ingredients are uniformly moist. It is not necessary to knead or continue mixing once the ingredients are wet. This will produce a loose and very wet dough. Cover with a lid (not airtight), or plastic wrap with several holes poked into it. Allow the mixture to rise at room temperature until it begins to collapse, about 2 hours, but no more than 5 hours. After rising, the dough can be baked immediately, or tightly covered and refrigerated up to 14 days. The dough will be easier to work with after at least 3 hours refrigeration. To bake, prepare a pizza peel by sprinkling it with cornmeal. Alternatively, overturn a baking sheet and sprinkle it with cornmeal. This will prevent the bread from sticking when you transfer it to the oven. Uncover the dough and sprinkle the surface with flour. Pull up and cut off a 1-pound (grapefruit-size) piece of dough (serrated knives are best). Recover the remaining dough in the bowl and refrigerate for baking at another time. Hold the mass of dough in your hands and add a little more flour as needed so it won’t stick. Create a smooth ball of dough by gently pulling the sides down around to the bottom, rotating the dough as you go. While stretching, most of the dusting flour will fall off. The bottom of the loaf may appear to be a collection of bunched ends, but it will flatten out during resting and baking. This shaping should take no more than 1 minute. Place the dough on the peel or overturned baking sheet. Allow the loaf to rest for about 40 minutes. It does not need to be covered. The bread may not rise much during this time; this is normal. Twenty minutes before baking, place a pizza stone on the center rack of the oven. If you don’t have a baking stone, use another baking sheet. Remove any upper racks. Place a broiler pan on a rack below the pizza stone or on the floor of the oven. Preheat oven to 450°F. When the dough has rested for 40 minutes, dust the top liberally with flour, then use a serrated knife to slash a 1/4-inch-deep cross or tic-tac-toe pattern into the top. Slide the loaf off the peel or overturned baking sheet and onto the baking stone. Quickly but carefully pour 1 cup of hot water into the broiler tray and close the oven door. Bake for about 30 minutes, or until the crust is nicely browned and firm to the touch. 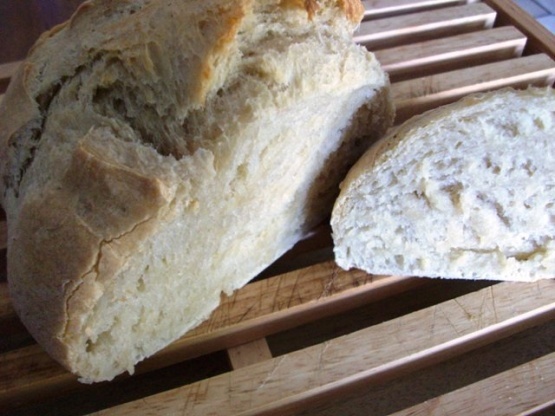 Allow the bread to cool completely, preferably on a wire cooling rack.